Gas dryers are another gaining in popularity. It is imperative that this fryer is properly vented to the outside of the house. The gases emitted from a gas dryer contains carbon monoxide along with the hot air. You should take every effort to vent the dryer through a wall, foundation or even roof. The hot air from a dryer contains moisture and so it doesn’t rise as easily as dry air. It is suggested that you use a 4 inch galvanized steel or either a flexible aluminum tubing to ventilate the dryer. Try and keep this line under 16 feet. Here is how you can vent a gas dryer to the outside of your house. It’s easy and straight forward. Locate the space in the foundation you will use to vent your dryer. The gas dryer should not be vented to another room inside the house.Then, drill a 4 ¼ whole in the side of your location. Make sure this hole leads to a basement or similar. Attach the vent hood into the opening of the hole. The 4 inch attachment connected to the hood will fit into the hole. Connet the vent hood piping to the 4 inch galvanized pipe. Take a c4 inch lamp and secure the two pipes together. Make sure the clap is tight with your screwdriver. For added support, screw a hanger into the floor above the piping. 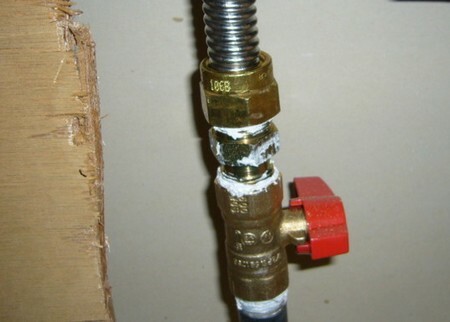 Keep connecting the pipe at regular intervals until you get to your gas dryer. You may have to secure the pipes together with elbows along the way. Duct tape should be used to seal the pipe at the joints. Use your level for this next step. Hang your ventilation piping from the joists. Make sure there is a ¼ inch per foot slope so that all water can drain properly. Dryers emit hot and moist air. This moisture tends to condense inside of piping. If the surrounding environment is cooler than the air, this will happen. To access your gas dryer you need to insert a pipe with a flange attached through the 4 ¼ inch hole in the wall or flooring. Screw the flange into the wall ot floor to secure it. Use a galvanized or aluminum pipe to run from the vent to the flooring or wall. You need to secure both ends of the piping with clamps.